Firstly, you have to keep your baby away from any noise, to achieve that you have to place the crib in a corner furthest from the door and away from any windows. 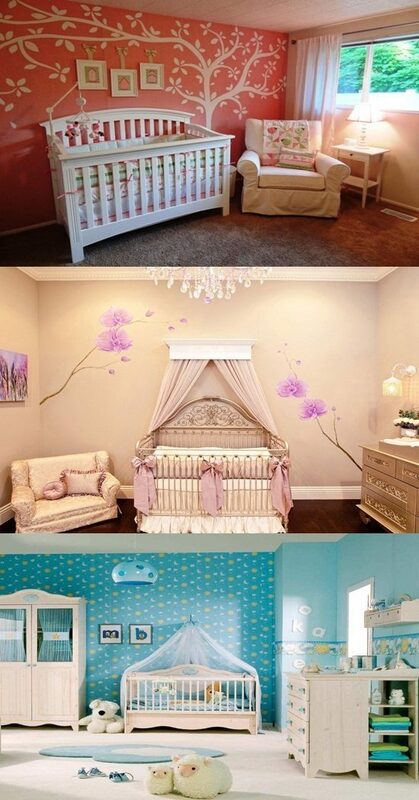 But keep in mind the crib should be placed in the most airy part of the room. When choosing furniture for your baby girl’s room, it’s better for you to choose pieces of furniture in order not to congest the room. If you have a large baby girl’s room, then you can easily add a dresser for clothes and storage for toys and books. Why don’t you set up a safe area of the room for playing, and allocate another easy access area for diaper changes? To create a joyful environment for your baby, you should decorate your baby girl’s room with themes like; beaches, underwater kingdoms, butterflies, flowers, ballerinas, farms and jungles. Remember to go for crib sheets, blankets, hankies that go well with your theme. The best room walls colors for girls are lemon yellow, peach, light green. Sunlight has a great influence on your baby and can make your baby grow faster, so you have to opt for the room that has good cross ventilation and allows a lot of sunlight to peep in. A plush rug in the middle of the room will surely elevate the atheistic value of your baby girl’s room. Try to get dark curtains in your baby girl’s room so that sunlight doesn’t disturbs while your baby girl sleeping. Spice up the wall by painting a ballerina mural or paste pictures of sweet ballerinas. You can make the ambiance more exciting by hanging 2 or 3 Spiderman figures on the ceiling of your baby girl’s room. When the wind blows the Spiderman will start swinging. You can visualize your desired decoration by grasping muse from the underneath photographs about the best tips for decorating a baby girl’s room.